Not all empires are lost and on this 12-night adventure, we’ll take you straight to the heart of a classical civilisation that continues to thrive today, the beautiful Tamil Nadu. Prepare yourself for an interesting history lesson as well as a spectacularly spiritual atmosphere as you explore this region and uncover Southern India’s secrets. From the state capital of Chennai with its British influence to the Gallic streets of Pondicherry you’ll witness the rich history of this spectacular place through architectural marvels such as the Meenakshi Temple in Madurai and the impressive mansions of Chettinad. This is one cultural discovery you’ll never forget. Colourful markets, streets bustling with activity and organized chaos are synonymous with the city of Chennai and it’s the perfect place to immerse yourself in the real India. You’ll be staying at the Leela Palace, a stunning not to mention exclusive seafront retreat that will be your oasis in this urban jungle. Remnants of the British rule remain and your visit to Fort St George, the fruit of the East India Company with its glistening white walls will transport you straight back to the 17th century. Dip your toe in the artistic waters at the National Art Gallery before being awe-struck by Kapaleeshwar Temple, a masterpiece of design. Enjoy delicious traditional dishes like Masala Dosa at one of the local restaurants before a walking tour through George Town where you can browse the vibrant market stalls. Leave the frenetic capital behind as you head towards the former French colony of Pondicherry. Break up the three-hour drive with a stop at the Shore Temples at Mahabalipuram, a UNESCO World Heritage Site and magnificent souvenir of the Pallava kingdom. Ornate carvings tell the story of this ancient society’s myths and gods and are a poetic depiction of a once powerful civilisation. After you arrive in Pondicherry you can relax at Palais De Mahe, your home from home for the next two nights. On day four of your trip, hop on a bike and cycle along the tranquil cobbled streets of the old town drinking in the contrasting combination of French and Tamil style buildings. Visit the Ganesh temple in time for morning or evening prayers and receive a traditional blessing before setting off on the next stage of your Tamil escapade. A scenic five-hour drive will take you deeper into the secluded land of Tamil Nadu where you’ll spend the next two nights at the Visalam, a carefully restored mansion. You’ll be off the beaten track here and with such a peaceful and atmospheric place to rest your head you might never want to leave. Unwind by the poolside soaking up the sunshine at your colonial hideaway before visiting the nearby home of Mrs Meyappan where you’ll be taken under the wing of one of South India’s best chefs in a first-class cooking lesson. The four-hour car journey leads you up the hillside to your hotel, Rajakkad where you’ll be greeted by the aroma of freshly brewed coffee and fragrant spices that make this plantation a fantastic choice. Spend the afternoon recharging your batteries exploring this lush estate before a well-deserved sleep in this intimate boutique hotel. Start the morning with sun salutations in an expertly led yoga class followed by a visit to a breath-taking waterfall accompanied by a scrumptious picnic. From here you can choose to stretch your legs and walk back to Rajakkad or rest up and take the car. The iconic Meenakshi Temple is just two hours from Dindigul and has come to represent the town of Madurai. 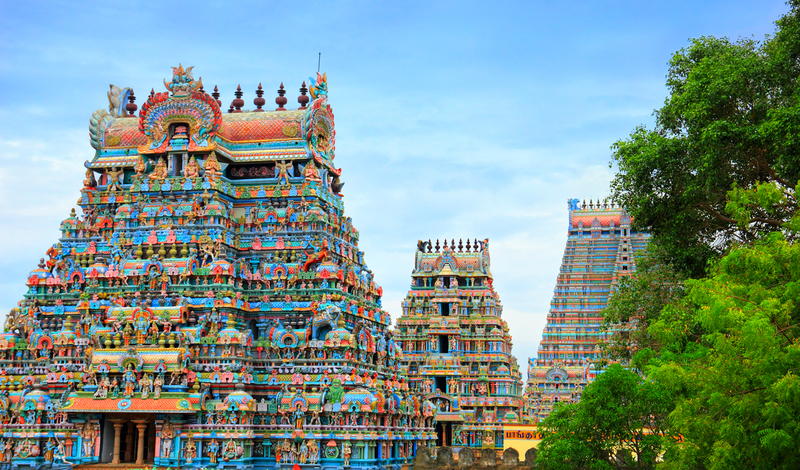 It’s both one of the biggest and most important temples in India making it a must-see on your Tamil adventure. Get a glimpse into the local Hindu practices as you watch the preparation of the ‘food for the gods’ before searching the buzzing marketplace for a little something to remember your time here. Spend the night at the Heritage Madurai being pampered to perfection in your luxury villa. After you touch down at Rajiv Gandhi airport you’re soon traversing the charming roads leading up to the “mirror in the sky” which is also known as The Taj Falakuma Palace, your heritage hotel on the hill. The Palace was once home to the Nizam of Hyderabad who was once considered to be the richest man in the world. Kindly, the Nizam has opened the doors for you to enjoy the luxuries he and other Royals had previously experienced. Your guides of the old city are a group of local ladies whose passion and knowledge of their Hyderabad is spotless. ‘Food for the Kings’ is the name of your final walking tour, guiding you through the bustling market streets and the historical delicacy of the traditional biryani dish. 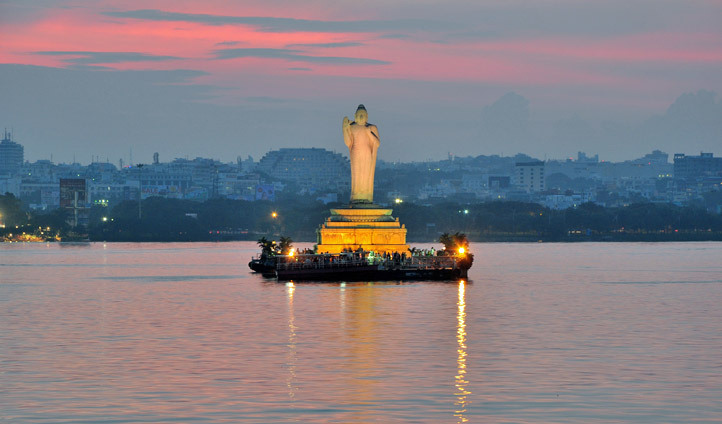 Hyderabad is a vibrant, chaotic and absorbing city that brings you to a tender end of your Tamil tour of Southern India.